“Dust Devils,” Beneath Ceaseless Skies. “Millepora,” Flash Fiction Online (March 2016). “Black Hearts,” Pseudopod #467 (February 2016). “White Elephant,” Flash Fiction Online (October 2015). “Nothing Goes to Waste,” Lightspeed: QDSF! Reprinted and available online in Hair Trigger 2.0’s first issue. “White Poplar,” Daily Science Fiction (May 2015). “The Snake-Oil Salesman and the Prophet’s Head,” Beneath Ceaseless Skies (April 2015). “Some People Belong Inside,” The Masters Review: New Voices (April 2015). “A Beautiful Memory,” Apex (March 2015). “Animal Magnetism,” Urban Fantasy Magazine (January 2015). “At First Glance,” Daily Science Fiction (October 2014). “Good Kids,”Daily Science Fiction (August 2014). “Dogs from Other Places,” Intergalactic Medicine Show 38. 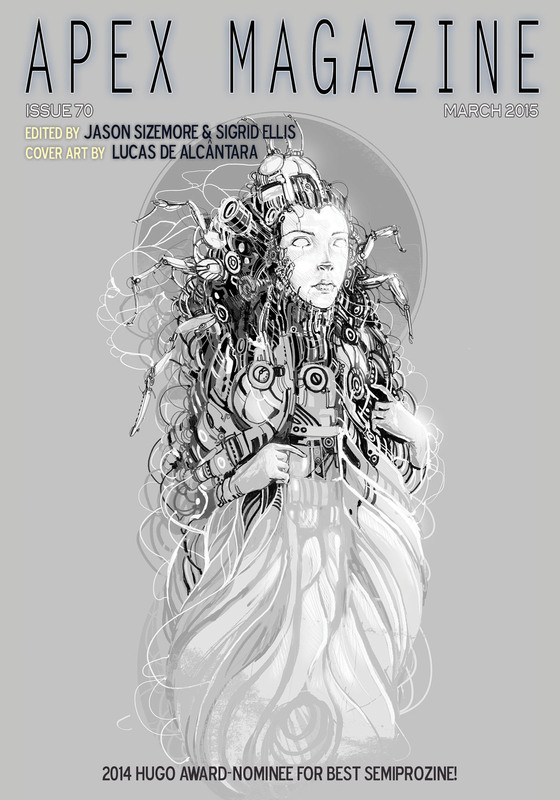 Available free as part of the IGMS “Not a Hugo Sampler” issue. “Saltcedars,” Daily Science Fiction (February 2014). “Scavengers,” Writers of the Future XXIX.